I’m excited to tell you about my new novel releasing September 15th called Magnolia Storms! And, of course, I can’t wait for you to meet the hero of the story, Josh Bergeron! So what does a ship pilot do? Ship captains travel the world’s oceans delivering cargo, but as they approach shallow water, they need pilots aboard to advise them for safe passage. The pilot boat meets the ship and maneuvers alongside the moving ship whose crew has rigged a pilot ladder that the pilot uses to climb up to the main deck of the ship. That’s where things can get tricky! The pilot makes his way to the bridge where assumes control of the ship and directs its movement by giving orders to a helmsman who steers the ship. The pilot disembarks only when the ship is safe from the danger of grounding. I hope you’re as fascinated as I am! 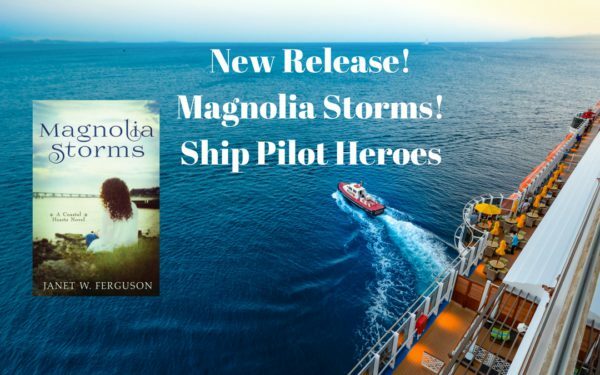 Here’s more about Magnolia Storms! Since writing this novel, the disaster in Texas happened, and I’m certainly praying for all involved. Praying for Florida now, too! Thanks for sharing your new story. Sounds interesting. Hi Priscilla! Thanks! It really was fascinating! I am thrilled to see you have another book coming out!! I lived the BLOWN series and now and I solo ready for more from you! Hi Paula! You are so sweet!! Thank you!! I hope you enjoy!! The book sounds so interesting! And I never even knew there was such an occupation as a ship pilot. Hi MH, I knew he was a pilot, but I had no idea what that meant! It’s really an important career! Hi Janet! Informative post. Love hearing about a different and unusual occupation for the hero of your story. About 10 years ago, another English teacher and I did a Mark Twain tour to Hannibal, Missouri and did two cruises on the Mississippi River. Enjoyed watching the barges going by. One barge holds so much more cargo than a semi. Also enjoy cruising the Rhine River in Germany. Ship captains are special. Looking forward to reading Magnolia Storms. Best wishes and enjoy your weekend. Hi Renate! I’d love to see all that!! I love watching the water and ships! Some of those things are enormous!! I hope you like my new story, and have a good weekend, too! I’m really looking forward to reading your new book! I live in Texas, though not in Houston, so yours is a book that I’m sure will really resonate with me. We were blessed and Harvey turned past us, but while we prepared for the storm we had to realize all over again how we had no control over the situation and needed to keep trusting in God. Praying for those affected by Harvey, as well as those who will be affected by Irma. Hey Lindsay! I’m praying for all those affected, too. I’m glad it missed you. Yes, sometimes we have to just cling to the fact that God is in control. Thank you. :) God bless! Fascinating and your new book sounds good!! Thank you! I though it was fascinating, too! I hope you enjoy! Interesting learning about ship pilots, your book sounds exciting! Such a timely release on the heels of Hurricane Harvey and in the thick of Hurricane Irma. What a year! Looking forward to reading Magnolia Storms. Valerie, I had no idea this would all happen, but God did, and perhaps, someone may be comforted by this story. What an interesting occupation for a hero. Sounds like an interesting story. Hi Jessica! Thanks! It was fun to research! I hope you like it! After reading about your cover, every time I see it I love it! These videos were fun to watch. I am really looking forward to reading your book! Hey Becky! Isn’t that crazy wonderful about the cover! I’m glad you liked the videos. I watched a ton of them. I hope you like Magnolia Storms! My FIL was in the US Navy in WWII so I’m always interested in reading anything about ships, sailing, boating, water related crafts. Wow, I’m not sure I could be a captain of a ship. The endless water is too much for me. I do love stories with pirates and ships, but I don’t think I would want to do it myself. I think part is the fact I don’t swim well and I get a little motion sickness. Thanks, Autumn! I hope you like it! With all of the storms, I’d hate to be on a boat! You would be a new to me author. Thank you for the giveaway opportunity. Hey, Perrianne! Yes, the water would not be where I’d want to be right now! Thanks for saying hello! Janet, thanks for the informative post. You’re welcome, Merrillee! Thanks for popping in! This is a new author to me. Sounds interesting. Thanks, Lucy! It’s great to meet you!! I hope you like it! I didn’t know there was such a person. I just mentioned it to my husband who was on an aircraft carrier in the navy. And of course, he knew about it from there. Hi Sherri! I didn’t know much about it either. I guess it was just off my radar even though I knew my friend had chosen this career. New author, I would love to read this. I actually lived on the MS coast during Katrina, and shortly after lived in Ocean Springs. Hey, Charlotte! I’m so happy to hear from someone from the Mississippi Coast! I know you went through some hard times in Katrina, but I hope you like the story. I love Ocean Springs. It was fun to go research. This sounds like a great book. Thanks for the background info. You’re welcome, Pam! I enjoyed the research :) Hope you like the story! Hi Sabrina! It is an amazing job! Thanks for the best wishes! Sounds like a great book, especially with the current storms. Prayers to all those involved! Hi Susanne! I had no idea that all this would occur, but God did, and I hope my little story is used to help somehow. Thanks! I hope you like Josh! I thought he was so much fun to write! Yes, praying, too! Thanks for sharing, Janet! Sounds like a great story! Hi Laura! I did my best, ha! I hope you enjoy!! I’ve been wanting to read this book. I have been through several hurricanes and just had Hurricane Harvey visit us. The book sounds really good. Thank you, Deana! Prayers and hugs as Texas recovers!! Hi Janet, I have purchased your book (on Kindle) and can’t wait to start reading it!!! Yay, Jackie! Thank you!! I hope you like it!! You are so kind and encouraging!! I find those videos so fascinating! Trying to imagine what it takes to be a pilot on a cargo ship is daunting. I don’t know if I’d want the responsibility, especially in a storm. You have to admire the guys who have nerves of steel…lol! Thanks, Teresa! I love the water, too! The timing of the release of your book is amazing given the recent hurricanes! I’ve read fabulous reviews about your new book. Congratulations!